I'm having a cuppa and enjoying the wifi at a little cafe' in Topeka, Kansas, in between a couple of workshops I'm doing on communication and diversity. The topic is timely: on the heels of a historic election, after a particularly mean-spirited political season, during a period of national anxiety. Americans have been drawing lines vigorously. On both the personal and political levels, we tend to batten down when we're scared, and we get scared when we think our piece of the pie is possibly up for grabs. And when we're scared, we often act direct from our reptilian (read: fight of flight) brains. It's not pretty, but it's pretty common. When my sister drove me into Topeka from the airport, we made an immediate pilgrimage to the Brown vs. the Board of Education historic site. It’s the only national park site named after a court case. Here in 1954, in the heart of the heartland, the legal segregation of schools by race was ended. 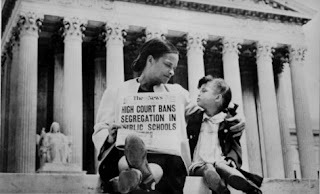 I wasn't even born when 7 year old Linda Brown's father sought permission to let his daughter attend her all white neighborhood school, rather than make the mile-long trek across dangerous railroad tracks to the black school. The decision was made in the mid-50's, but years of dissent, marches and bravery were needed before integrated school were mostly a reality. Mostly, because racism persists in subtle and not-so-subtle ways in institutions and in community. Four months ago I had the privilege of a viewing an exhibition of Civil Rights memorabilia at the High Museum in Atlanta. I was disturbed and deeply moved by the photographs of Rosa Parks’ arrest, nonviolent protesters being hosed and beaten by police, and the little girl walking through a path of angry, threatening grown men scared because she wanted to go to a white school. I was astounded by the courage of so many with so little, and how they changed history. How do we mend our separations? At the workshop I gave today on diversity, I talked about how we are all viewing the world through our tiny lens, thinking we are seeing the truth. A participant asked how one could enlarge the view. My immediate answer-- stretch your vision. We're scared of what we don't know. And when we align ourselves with like minds, we reinforce our belief that we are the norm. Research on dealing with fear tells us the best way to reduce it through exposure. The philosopher Kierkegaard said it as well-- to grow, move toward what makes you anxious. Expand, don't contract. We may not all have the same experiences, but we experience the same primal events, of love, fear, suffering. There is much more that unites us than separates us. Jung teaches us that there is nothing we can perceive we have not experienced on some level, so even that we reject has somehow, sometime, been a part of us. When we open up to new ideas and experiences, and seek to understand, we can't help but grow.